Who Knew Deer Liked Salad? 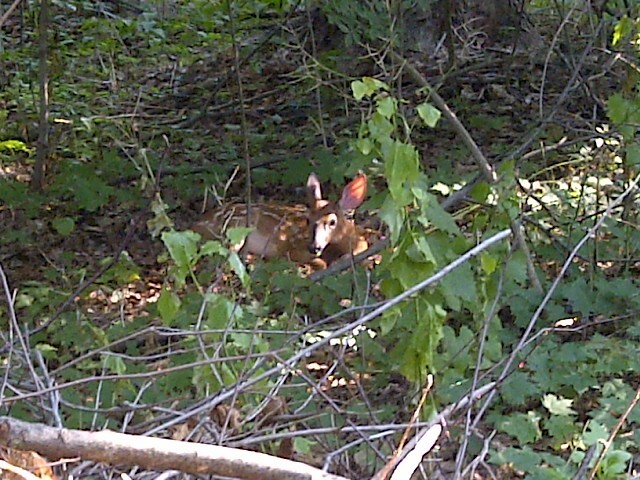 About 10 days ago–during that last heat wave–I walked into a wooded area on my property with my dog and this fawn stood up. If it had not, chances are I never would have noticed it at all. I’ve been having a tremendous amount of deer browse damage this year. Most of it I tolerate. The deer have to eat something and so much of the land in my town is getting developed. Even my new neighbor across the street has taken out countless trees and undergrowth–which is where the deer used to leave their fawns during the day while they were off foraging. I guess I’m one of the few “wild” places left in town. One of the places I’m trying not to tolerate the “browse” however, is in my vegetable garden. I’m looking for creative and non-toxic solutions so that I actually get to eat some of my vegetables this year. So far the pole bean leaves have been browsed to the stems several times and the tops of the tomatoes have been nibbled off (hard to get tomatoes that way!) The lettuce was completely eaten, but fortunately only at the end of the season. The Spoiler won’t permit fencing so I’m at an impasse. I guess he really doesn’t like vegetables. I use hoops with bird netting over them…it is a pain to secure and unsecure with staples I found at Gardener’s Supply but it works. They jump my fences so it is all I have left. Thanks for your thoughts. I wanted to simply put 4 stakes around the veggie garden–it’s very small, only 6’x8′–and then string up a couple of layers of fishing line around the stakes and hang CDS–you know the things that are so tough to recycle that I have a bag full of them dating back to when AOL used to send them in the mail?–from the line at different heights. I figured the deer wouldn’t like bumping into the CDs and perhaps, just perhaps, the flashing from the CDs would frighten them. Well, even THAT was too much for the Spoiler (aka my husband, if you hadn’t guessed!). What I have done for the moment–and so far so good–is gotten some of that DeerStopper deer tape from Messina. The reviews on it are terrible but for the moment, for me, it’s working. And I used 2 layers of it, as they suggested, for the “heavy browse” situation. It’s black so it’s relatively unobtrusive. And I just tied it around the stakes at the corner of the garden. We shall see. It’s only been 9 days though. If all else fails, the stakes are there if I need to net the thing. As I said, all my neighbors fence or net their gardens. I don’t know why he thinks we’re so “special” that we don’t have to! Thanks for reading and sharing what works for you! Can you remind people how important it is to not let your plants dry out. I am finding flowers on some plants aborting. They think there is rain on the way so they hold off on the watering. Excellent point! And your comment about rain, although good, doesn’t necessarily mean folks should be relying on nature to water. I did that myself this weekend and then was running out with a hose this morning before work! Not what I wanted to be doing! I’ll send out a tweet, which should show up in my sidebar, and do a post this week! Deer damage is discouraging and I finally put up a fence. They can jump it but tend to go a different way instead. Before their normal path was to cut a diagonal through the back yard where I garden and everything was tempting to them. This is the first time in years I’ve been able to grow garden phlox without deer eating them all. Good luck Karla! Yes, that’s exactly my situation–they cut a path right down to the bedrock in my yard. I’m on a well-established deer trail–and as I said above, I’ll tolerate browse, even on my perennials. They’ve eaten about 1/4 of my 16’x18′ perennial garden down to nubby little nothings. And that’s fine–they do have to feed the baby. Thanks for sharing with your comment! I don’t have to deal with deer yet (though in nyc, we now have a small herd in our green belt) but for the 1st time in 28 years of organic gardening, leaf spot took out half my tomato plants, despite a desperate last-ditch organic spray effort. I’m so discouraged! We love veggies! Oh how disappointing. It seems as if we wait all year for out tomatoes and then something always conspires to deprive us of our fair share, doesn’t it? Thank goodness for Farmers’ Markets, although it’s not quite the same as true home grown.